The vibrant economy is bringing a resurgence of interest in holiday shopping for custom homes and homesites on Dove Mountain. The renewed interest in million-dollar homes is occurring in two very special neighborhoods – Canyon Pass and The Ritz-Carlton Residences. Both gated neighborhoods feature incredible properties, yet different and wonderfully unique lifestyle choices. 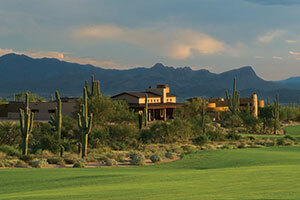 Two-acre plus homesites tucked within a gated enclave with 2,000+ acres of high Sonoran Desert. Stunning panoramic canyon views of ancient rock formations, hanging cliffs, towering saguaros and lush colorful desert vegetation. Homesites carefully set within native terrain preserved for desert birds, coyotes, white-tail deer and the occasional bobcat or puma. Quarter-acre to seven-acre homesites adjacent to a world-class Jack Nicklaus Signature golf course. Legendary Ritz-Carlton, Dove Mountain amenities, including personal chefs, cleaning and other coveted concierge services. Walking distance to the resort, golf club, fine dining and your spa appointment. Eight highly customizable home layouts ranging from 1,900 to 5,400 square feet as well as custom estate homesites. Breathtaking Sonoran Desert views with incredible preservation of the surrounding landscape. Miles of natural wilderness hiking paths. Fine dining, the spa and festivities at The Ritz-Carlton, Dove Mountain. Nearly endless health and fitness opportunities. Convenient access to Tucson cultural arts activities, sports and festivals. Dove Mountain residents are invited every year to celebrate the holidays at The Ritz-Carlton, Dove Mountain. Treasured events include special Thanksgiving and holiday meals (you can even enjoy a meal within a life-sized gingerbread house), a holiday tree lighting celebration complete with a visit from Santa, entertainment and a community donation drive and fundraising event benefitting Casa de Los Niños (an organization devoted to the needs for at-risk children and families throughout Pima County). New Year’s Eve is also festive. The resort hosts a gala epicurean feast and fireworks. At the event, residents are encouraged to donate toys to Marine Corps’ Toys for Tots Foundation or canned food good for the Community Food Bank in Marana.